Frank Barstow Grimshaw was born at Wilmslow, Cheshire on August 10, 1882, the sixth child of Joseph and Jane or Jean (Barstow) Grimshaw. The family apparently lived on an estate called Hawthorn villa, which was sold to the British government in World War II. Frank Grimshaw apparently emigrated to America in about 1904 and subsequently married Edith Webster. The couple had two children – Betty Arundel and Chester Converse Grimshaw. They apparently lived in Essex, NJ, and Frank worked as an accountant in New York City. Circumstantial evidence indicates that Frank’s father, Joseph Grimshaw, was descended from the Audenshaw Grimshaw family line, which is described on a companionwebpage. 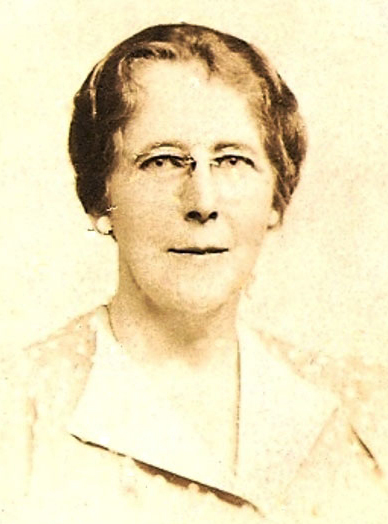 According to family lore from Anne Arundel Babcock, Frank and Edith Grimshaw’s granddaughter (daughter of Betty), Frank attended Cambridge and then emigrated to join the North West Mounted Police of Canada. However, these assertions have not yet been verified. Frank and Edith were apparently married in Hyde Park, MA, Edith’s home town, and the couple lived in Essex County, NJ (Glen Ridge, Verona, and Summit) while Franked worked in New York City. Where are Wilmslow, Cheshire and Bloomfield, NJ? Thanks go to Anne Arundel Babcock, Frank and Edith Grimshaw’s granddaughter, for providing family history information and many photos. Thanks also to Norman Grimshaw for contributing the information for the clue on Frank Grimshaw’s origins and for Cresswell Grimshaw, nephew of Frank Grimshaw who was killed in World War I.
Anne Arundel Babcock has provided the excellent photo of Frank Barstow Grimshaw shown below. The date of the photo is not known. Edith (Webster) Grimshaw is pictured below. The date of the photo is unknown but may be in the same timeframe as the above picture of Frank. The ancestor and descendant chart shown below can be constructed from information known thus far on Frank Grimshaw (provided below on this webpage). |—Earnest Harry Grimshaw (ca 1868, Huddersfield, York – ?) & Charlotte Elizabeth A. R. Williamson. Married July to Sep 1894. Anne Babcock has provided a number of photos of Frank and Edith with their descendants; they are shown below. 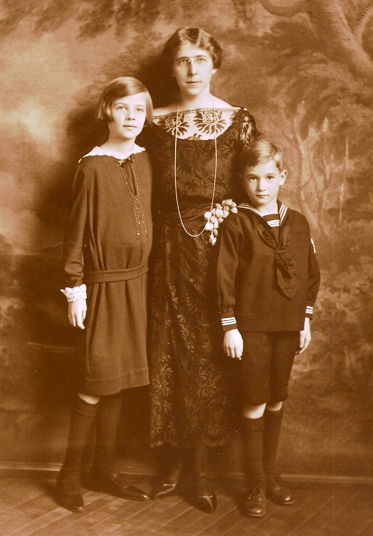 Edith Webster Grimshaw, Frank’s wife, together with children Betty Arundel and Chester Converse. In 1980, Chester Converse Grimshaw, son of Frank and Edith Grimshaw, wrote a response to a letter of inquiry from Edwin Grimshaw. The inquiry was sent to many of the Grimshaw families living in the U.S. at that time (see companion webpage). The letter from C. Converse Grimshaw is shown below. Thank you for the Grimshaw lineage you sent me. I dont believe any of the listed are related. The following is what I know of my immediate family background but have no records of the past lineage, for Grimshaw. I only have the lineage of my mothers side, who was a Webster, Converse (Noah and Daniel were her second cousins and the lineage goes way back to William the Conqueror on the Converse side. John Webster is as far back as the family had on Webster  he was born in England and came to this country in 1635 and founded Ipswich, Mass. Frank B. Grimshaw (B. for Barstowe) was born to Jean and Joseph Grimshaw Aug. 10, 1882 in Wilmslow, Cheshire, England. They lived on the estate called “Hawthorne Villa”. The Villa, when my grandparents died was sold to England for a hospital during World War II. My dad did tell me that Arundel was part of the lineage. My sister was named Betty Arundel Grimshaw. This is all we know right now and when I can find time, I may delve deeper into it. I do know that the Mormon Church in Utah has the most extensive lineage background for every name but what the charges are for the information, I have no idea. Thank you again for writing. The 1930 U.S. Census found Frank and Edith Grimshaw living in Glen Ridge, Essex County, NJ with children Betty A and Converse W (should be Chester Converse) Grimshaw. Also living in Glen Ridge were Hugh and Alice Grimshaw with children Edward and Jane. This family is descended from a different Grimshaw immigrant, as described in a companionwebpage on George and Mary (Barnes) Grimshaw. David Barstow has created a website on his family that includes information of the parents of Frank Grimshaw, Joseph and Jane (Barstow) Grimshaw. The website link and relevant family information are shown below. Frank Barstow Grimshaw not born yet at the time of the 1881 census record shown below for his family of origin at Hawthorn Villa. The probable connection of this Grimshaw family to the Audenshaw Grimshaw family line (see companionwebpage) are clearly indicated by the birth of both Joseph and Jane in Dorylsden, which is near Audenshaw, and by the birth of two of their children (Mary and Charles) in Audenshaw. The Ellis Island record shown below indicates that Frank Barstow Grimshaw, accountant, arrived in the U.S. in September 26, 1909 on the ship Cedric. However, he had already been living in New Jersey since 1904. He was classed as a “Non-immigrant alien”. He was born in Wilmslow, Cheshire, and was headed to 373 Franklin Street, Bloomfield, New Jersey. It seems likely that he was returning home from a visit to his homeland. Images of the original entry in the ship log follows the Ellis Island Passenger Record. From Frank’s registration card, shown below, it may be determined that he was married to Edith (Webster) Grimshaw, and that he lived in Essex, New Jersey and worked in New York City. Bloomfield, New Jersey, where Frank Grimshaw lived in 1907, is about 7 or 8 miles south of Paterson. This reference was found on page 882 (Ashton Section) of the 1879 British Commercial Directory and Shipper Guide under the category “Horse and Cattle Condiment Manufacturers”. Information from David Barstow’s website (reviewed above) indicates that Joseph was a “condiment manufacturer”, which indicates a definite connection. It seems possible that Joseph and Jane/Jean Grimshaw, who were married in 1867, may have been the proprietors of Grimshaw and Barstow in Guide Bridge in 1879. Or perhaps their parents were the Grimshaw and Barstow, and they met and married because the families knew each other. Despite this clue, Joseph Grimshaw, Frank’s father, has yet to be “tied in” to the Audenshaw Grimshaw family line. Creswell Young Grimshaw was the son of Frank Grimshaw’s older brother, Ernest Harry Grimshaw. He was killed in action during World War I trench warfare in France at the age of 22. He is buried in Vieille-Chapelle Military Cemetery, Pas de Calais, France. 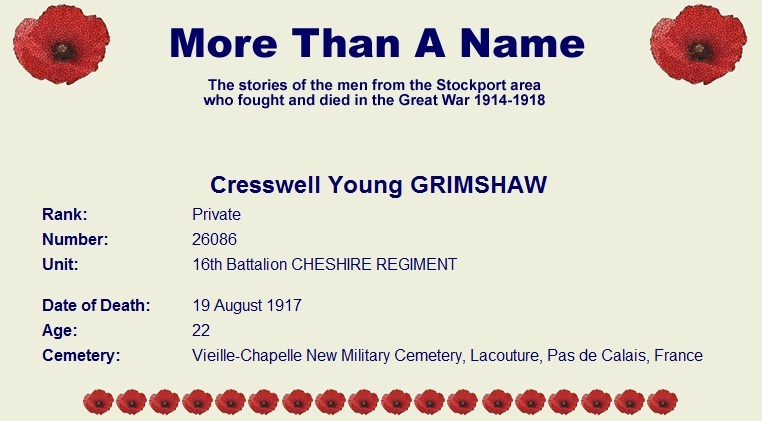 Norman Grimshaw has found the following excellent website record of Cresswell Grimshaw and his military service. Cresswell’s grandfather, Joseph Grimshaw, was a successful manufacturer of veterinary medicines. He lived at Hawthorn Villa, Albert Park, Wilmslow. His son, Ernest Harry Grimshaw got married between July and September 1894 to Charlotte Elizabeth A R Williamson, at St Thomas’ Church, Heaton Norris. A year later, Cresswell was born. At the time the 1901 Census was taken, it is possible that Ernest and Charlotte were not in the country as they do not appear to be listed. Cresswell, however, then aged 5, is listed as living in Wilmslow, presumably with his grandparents. When War was declared in 1914, Cresswell was serving an apprenticeship at Messr Henry Faulder & Co at the Company’s confectionary works at Stockport. He enlisted in May 1915. The 16th Cheshires was popularly known as a “Bantam Battalion” – its original members all having been previously rejected by the army as being under the regulation height of 5′ 3″. The Bantams went on active service in January 1916. By all accounts, Cresswell was a keen gardener and was reported to have even grown some flowers in the trench which he had sent to his grandparents. The conditions that men had to endure in the trenches makes this an unlikely story. On 19 August, the Battalion was at Lempire, approximately 20 kilometres north east of the French town of Peronne. They were in support of an attack by the 15th Cheshires and “W” Company gave covering fire. After the 15th had secured it’s objectives, “X” and “Z” Companies carried stores and ammunition up to the new front line. Cresswell was a signaller and his first job after an attack would be to ensure that any broken telephone wires were repaired. His officer wrote to his family telling what had happened. Cresswell’s comrade was another local man, Samuel Daniels. They are now buried next to each other. Villers-Faucon was captured by the 5th Cavalry Division on 27 March 1917, lost on 22 March 1918, and retaken by the III Corps on 7 September 1918. The Commonwealth graves in the communal cemetery are those of soldiers who died in February-August 1917, or (in the case of two who are buried in Row B) in September 1918. They were made by the cavalry, the 42nd (East Lancashire) Division, and other fighting troops. Note: Private, Cheshire Regiment. Age: 22. Converse Grimshaw, son of Frank and Edith Grimshaw, lived in Tulsa and died there in 1994. Coincidentally, the descendants of William R Grimshaw, who was born in New Jersey in 1892, also lived in Tulsa. William Grimshaw migrated to Tulsa in about 1920 and is not related to the family of Frank Barstow Grimshaw. William’s family is described on a companion webpage. Webpage posted December 2008.Updated September 2009 with addition of arrival information from Ellis Island and maps of Wilmslow, Chester and Bloomfield, NJ. Updated November 2010 with addition of draft card and introductory text. Updated February and March 2011 with addition of photos and family information from Anne Babcock.